* On Wheelchair Gloves there is FREE SHIPMENT. The price at the bottom of the page already includes the shipment. * See how to choose the right gloves according your purpose. ( At the bottom of the page). 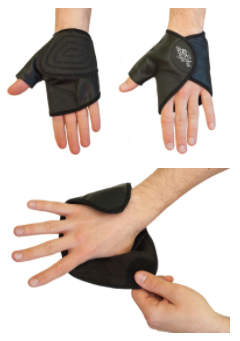 Quality half-finger leather wheelchair glove with a grippy palm material. This durable wheelchair glove is designed for improved traction for an active lifestyle, including sport and wet weather. Ultra-Grrrip Half Finger Wheelchair Gloves are our most popular wheelchair gloves. These full finger wheelchair gloves are identical to the gloves above, with the same leather and the same grip palm. The only difference is that the entire hand is covered by the glove. These wheelchair gloves are ideal for year round use. Same grip palm material as the Ultra-Grrrip gloves above, but there is a gel insert in the palm to help protect the hands from the impact from repeatedly striking the pushrims. The back of the glove is made from absorbent terry material, with a reflective piping built in for nighttime safety. These gloves are built for comfort and everyday use. For more active use consider one of the two Ultra-Grrrip gloves above. The gloves feature our unique patented design. It was designed for people with limited hand mobility. The glove opens wide so that it is easy to insert the hands and closes with a strap. There are no finger holes so it is easy to insert the hand and the fingers are free to move about. The palm side the grip is divided into two parts to create a "hinge" effect making the grip close easily and naturally around the push rim. The grip material is made of sturdy textured rubbery material which is designed to improve your grip on the wheelchair pushrim. The palm design is identical for Strap N Roll and Gator Gloves which are described below. 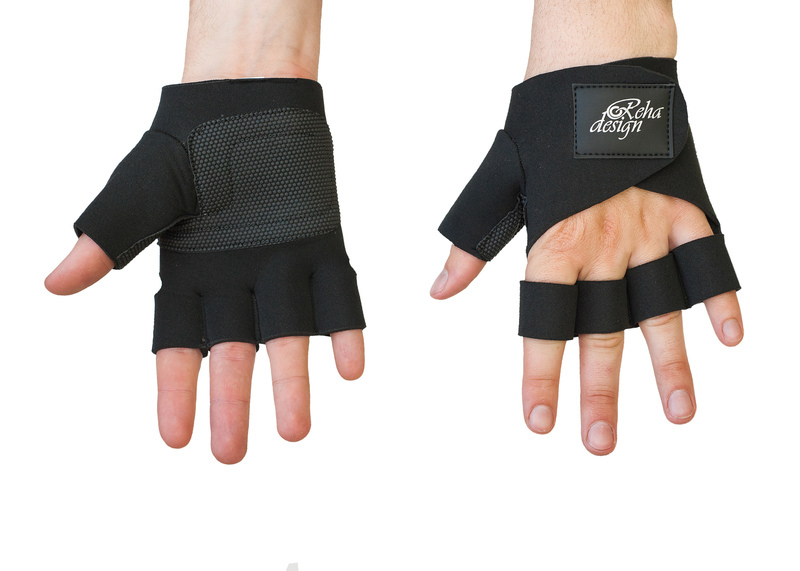 Similar to the Strap N Roll, but this gloves closes with hook-and-loop (velcro-type) fastener. As a result, this gloves opens extremely wide like the mouth of an Alligator (thus the name "Gator Gloves") allowing the hands to be very easy inserted. Soft comfortable, lightweight wheelchair gloves for people with limited hand mobility. Flexi-Fit Wheelchair Gloves are made from soft, flexible neoprene. Flexi-Fit Gloves are intended for comfort and everyday use around the house, but not for very active use. 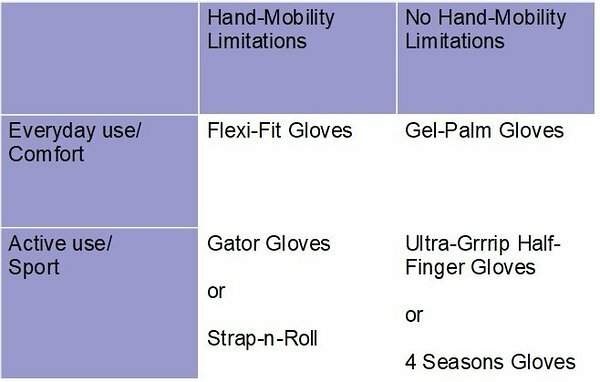 For active use or sport, please consider Strap N Roll or Gator Wheelchair Gloves. The best wheelchair glove for children because this leather wheelchair glove is adjustable and can "grow" with the child's hands. Tough and sturdy to protect the hands, with a grip material on the palm to making pushing easier and yet the soft textile lining on the inside of the glove makes it extremely comfortable. RehaDesign Children's Wheelchair Glove fits most kids between the ages of 3 and 7 years. For older kids order Strap N Roll Wheelchair Gloves Size XS. To determine your glove size, see the photo chart below. Measure your palm as shown in the photo either in inches or centimeters. Then look at the chart below to select your glove size. We carry S.M, L and XL in all styles. Note that we do carry XS and XXL in some styles but not all. If you require XS or XXL please contact us by email to confirm that they are in stock in your style.